I was pretty delighted to hear there is a Hobbit Hole in Port Orchard and I finally got to see it at the Brother’s Greenhouse. It is really well made and I actually got into it. The rest of the nursery was pretty great too, plenty of stock and helpful employees. They even had free cookies! We picked up some charming plants for the front porch. And oh my gosh, I can’t believe I’ve been working on this one time impulsive blog project for going on seven years now! It began in 2010. This entry was posted in Art -- there is art here!, Farms and Gardens, Port Orchard, Stores and other places that sell you things, Unique Shopping (stores with some personality), WA State - Kitsap County and tagged birds, Brothers Greenhouse, flowers, garden, gardening, Hobbit, Hobbit House, Hole, house on August 28, 2016 by admin. The Guardian Stone is Poulsbo’s newest public art installation and it is really lovely. My first thought was “oh, look, a sword in the stone! King Arthur!”, but no. It being Poulsbo, the piece is reflective of Norwegian history. The rock, steel and glass sculpture by Lisa Stirrett was installed in February 2016 at the Muriel Iverson Williams Waterfront Park. The nine foot tall piece is a nod to Swords of the Rock in Norway, though that piece is much larger (see a photo of that too). Really, it is captivating. You should go see it! This entry was posted in Art -- there is art here!, Parks, Poulsbo, WA State - Kitsap County and tagged art, glass, Guardian Stone, Lisa Stirrett, Muriel Iverson Williams, Norway, Norwegian, Park, Poulsbo, scupture, steel, stone, waterfront park on April 5, 2016 by admin. While Poulsbo was indeed settled primarily by Norwegians and other Scandinavian immigrants, sadly the Vikings did not make an appearance. But perhaps now they have through James R. Mayo’s humongous mural on Boehm’s Chocolates on Front Street. The mural was painted in 2011. I was surprised to learn that until World War II Norwegian was the dominate language in Poulsbo. While visiting the small city for a seasonal day trip, I also captured a few Christmas photos. 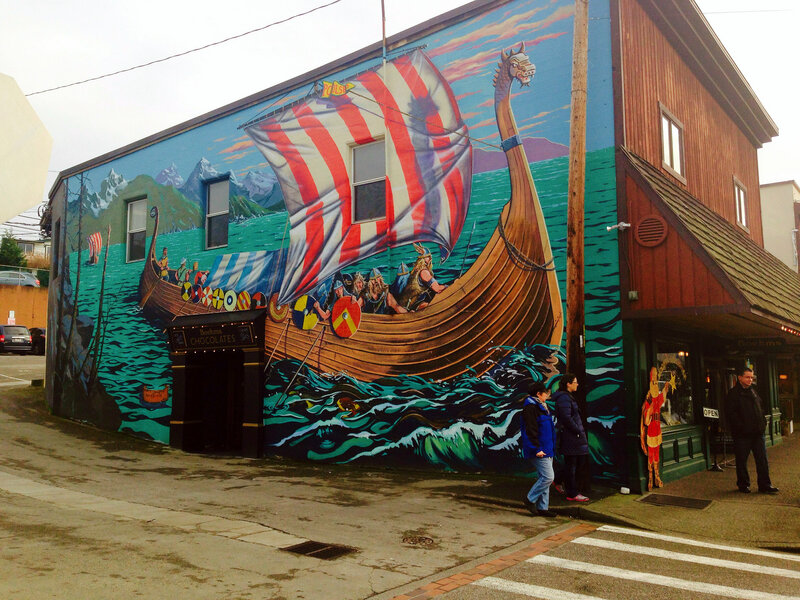 This entry was posted in Art -- there is art here!, Poulsbo, WA State - Kitsap County and tagged art, Boehm’s Chocolates, Christmas, James R. Mayo, mural, Norway, Norwegians, Poulsbo, vikings on December 23, 2014 by admin. 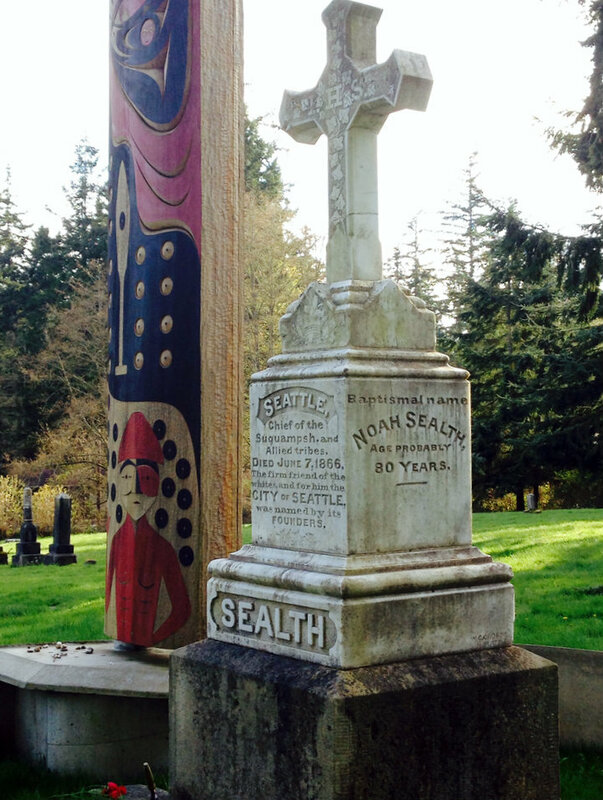 Chief Seattle’s grave site is located at 7076 NE South Street, Suquamish, in the Suquamish Tribal Cemetary just behind St. Peter’s Catholic Mission and north of Bainbridge Island. While we were there, several small groups came to pay their respects and some have left tokens, mostly shells, but also some art and coins. To either side of the headstone are tall, painted carvings. He was buried here in 1866 and the headstone was put into place in 1890. It is obviously from other photos on the internet, that the grave site has recently been improved. Chief Sealth was born in 1786 and was a Chief of the Suquamish Tribe. The city of Seattle was named after him. Saint Peter’s Catholic Church was built in 1902, replacing an older church. The windows of the current church were taken out of the original church. More about the site can be found here. This entry was posted in Art -- there is art here!, Cemetery, Churches, Places of the Spirit, Suquamish, WA State - Kitsap County and tagged Bainbridge Island, burial, carvings, Catholic, Cemetary, Chief Seattle, Church, City of Seattle, grave, gravesite, Mission, Native American, Sealth, St. Peter's, Suquamish, tokens, Tribal Cemetary, Tribe on April 1, 2014 by admin. 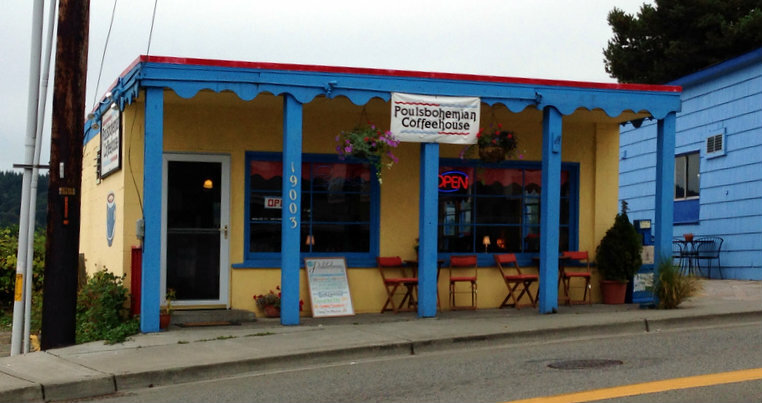 Poulsbo Marine Science Center at 18743 Front St NE, Poulsbo, WA 98370 was my choice while my dear husband perused antique stores in the charming town of Poulsbo. The center is free, though donations are encouraged. There is a large open touch tank as well as several aquariums with such great things as jelly fish, clown fish, sea stars, sea anemones and an octopus (pictured above). This entry was posted in Museums, Non Profits, Poulsbo and tagged Aquarium, Center, clown fish, clownfish, fish, jelly fish, Marine Science, ocean, Poulsbo, science, sea anemone. 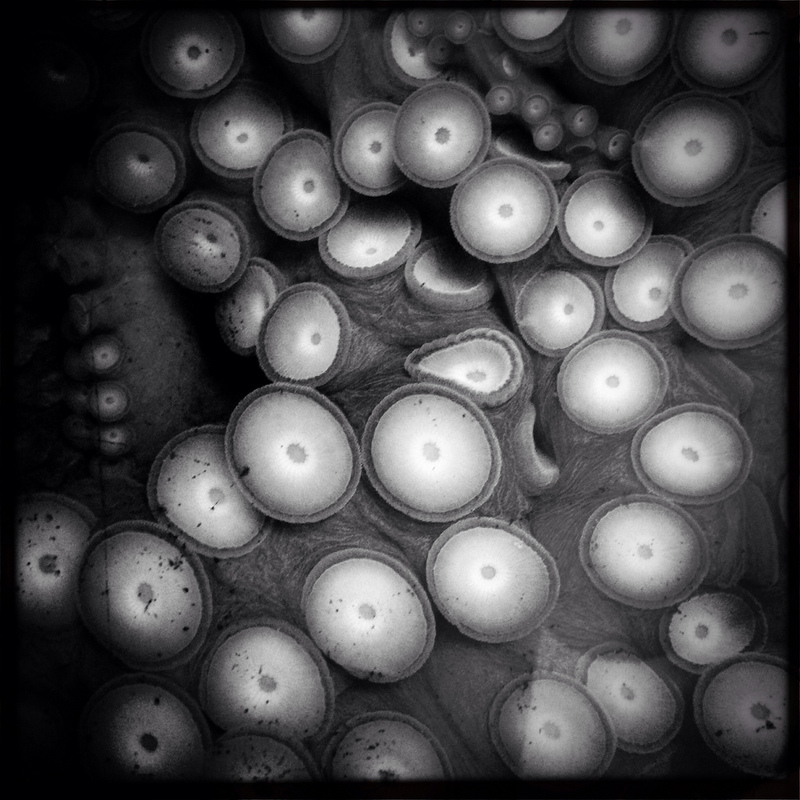 octopus, sea stars on December 29, 2013 by admin. It’s been three years since I’ve started this new place of the day project and as last year I wanted to pick an extra nice new place. The first anniversary I picked the Pagoda in the Chinese Reconciliation Park and last year I picked the Legislative Building in Olympia. This year dear husband and I went to Poulsbohemian Coffeehouse. Now I know that another coffeehouse doesn’t seem all to impressive, but this is my all time favorite coffeehouse. 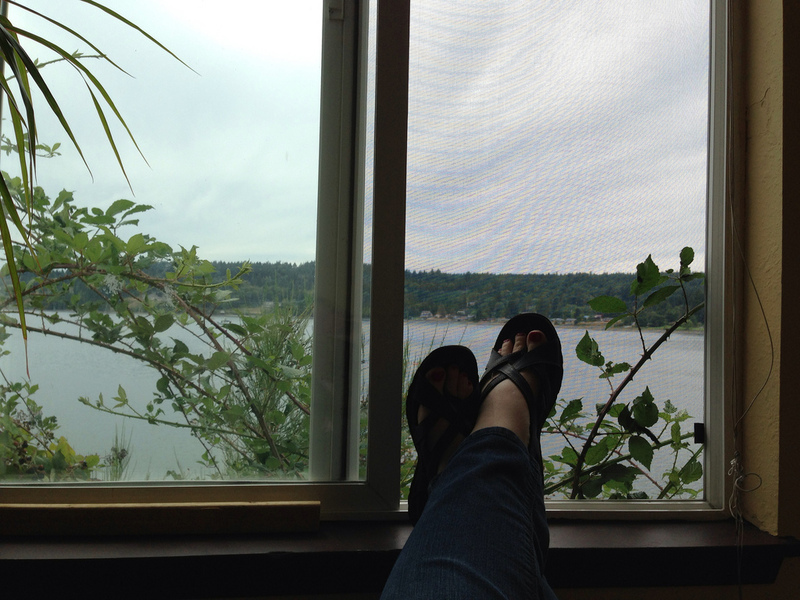 It was comfy seats, great coffee and food, an upbeat staff and a tremendous view. I ordered my iced Americano and happily sat in a comfy stuff chair facing the window. Life was good. This year I’ve added a new continent, Australia, as well as a return trip to Texas and a hop, skip and jump over into Idaho. My most popular type tags are Tacoma, WA, Lakewood, Art, Coffee and Restaurant. My most popular posts for the year have been FedEx (really?! ), Time to Stop U Betcha, Haunted Tacoma — Children’s Industrial Home Site, Loews Movie Theater, Casablanca Apartments, St. Rita of Cascia Italian Catholic Church, Marcato Condominiums, the Umbrella Mural on the Storage Box, Five Guys, the Flower House on Vassault and the Snohomish River Trail. Some of the places I checked out alone, but I often brought my husband, daughter and occasionally dogs along for company. They are good sports about the whole thing. Especially the dogs. Since dear daughter is now in college (college! ), we’ll be seeing a little less of her. I did miss a couple of days. There were a few days that I was sick and the weather was bad and a couple of days that things just got away from me. It’s OK.
Several of this year’s places have gone out of business including TOP Foods (in progress), Movies to Go, Van Lierop Bulb Farm, Park Avenue (I think), the admin office for Tacoma’s School of the Arts and the Norman Bates Motel. I went to some unusual places including a Davy Crocket’s Wife’s grave, the Roslyn Cemetery, Ginkgo Petrified Forest, Washington State University, Australia (Great Barrier Reef, Wild Dolphin Resort, Sydney Opera House), Tacoma Elf Storage, Underground Seattle, Bonsai Gardens, Hiram Chittenden Locks, the Olympic Sculpture Garden, the Buddhist Meditation Center, the Fremont Troll and a park with the top of my dad’s submarine. I have over 900 blog entries. The encouragement that I’ve received along the way has meant the world to me! Thank you. Update April 2016: Happily the coffeehouse is still doing well and I managed to snag the same chair as before! 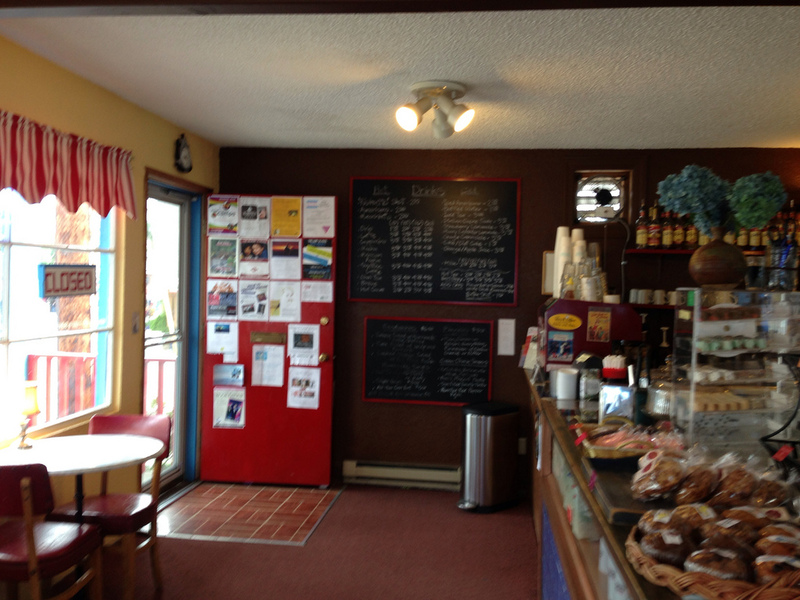 This entry was posted in Coffee Shops, cafes and bistros, Poulsbo, Restaurants, WA State - Kitsap County and tagged cafe, coffee, Kitsap, Poulsbohemian, view on August 28, 2013 by admin. …at least that’s what they said on their sign in their Eddie Bauer Outlet Store at 9990 Mickelberry Road, Silverdale, WA 98383. Everything in the store was 30% off, which was extra good since I had plans to visit today anyway. I picked up two pair of short ($30 each marketed down to $5 and then 30% off) and a pair of jeans. 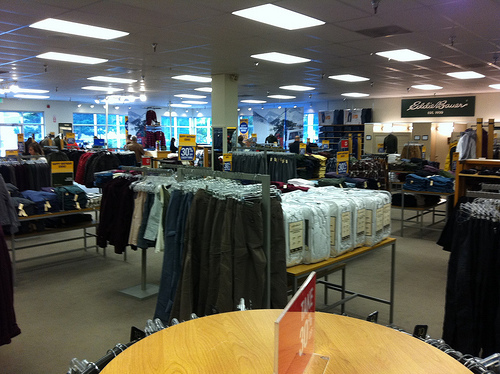 Eddie Bauer originated in the Northwest and first opened in Seattle in 1920 as “Eddie Bauer’s Tennis Shop”. The shop was only open during tennis season. In 1920 Eddie Bauer was 21. In the 1940s Eddie Bauer developed hypothermia while winter fishing in Washington State. Inspired he developed a quilted down coat that would prove to be warm and yet lighter then the heavy wool coats popular at the time. In 1968 the company sold to Bauer’s business partner and in 1971 it again sold; this time to General Mills. Spiegel purchased the company in 1988. In June 2009, the company filed for bankruptcy protection and in July of that year was acquired at a bankruptcy auction. 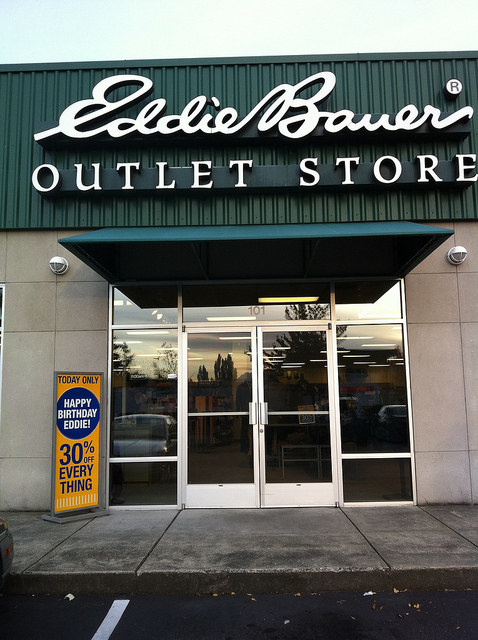 This entry was posted in Chain stores (there are a bunch of them), Silverdale, Stores and other places that sell you things, WA State - Kitsap County and tagged Eddie Bauer, fishing, General Mills, Northwest, outdoors, Seattle, Silverdale, Spiegel, tennis, WA on October 15, 2011 by admin. Until today I didn’t know that Port Orchard had a boardwalk! Our family went to Port Orchard to give my dear husband a chance to look at old nicknacks (ummm I mean go through antique malls). But dear daughter and I stretched our legs and found this boardwalk, with real boards and a lovely, lovely view. We walked it to the end, which took under 10 minutes. 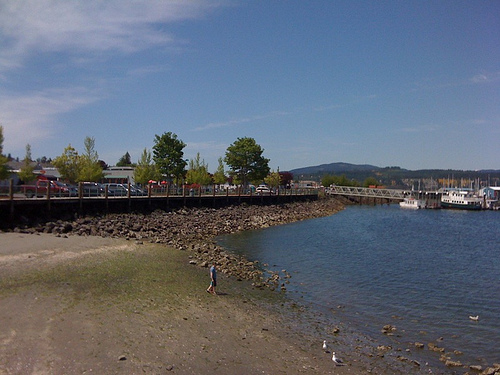 It turns out that the City of Port Orchard has some big plans for this little boardwalk. It is to be expanded to the Annapolis ferry facility and become part of the Mosquito Fleet Trail. This entry was posted in Historic Sites, Parks, Port Orchard, WA State - Kitsap County and tagged antique malls, boardwalk, Kitsap, Mosquito Fleet, Mosquito Fleet Trail, Peninsula, Port Orchard, view on June 5, 2011 by admin. For her upcoming birthday my dear daughter asked to go to one of her very favorite restaurants, which is named That’s-A-Some Italian Ristorante. 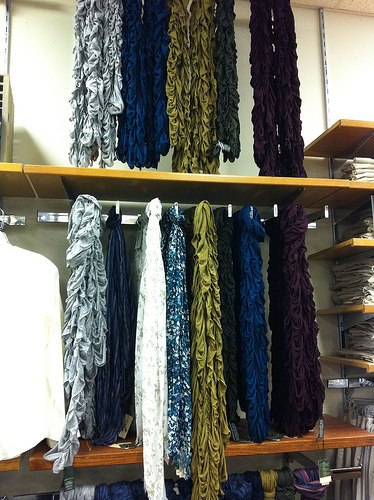 Located at 18881 Front St NE, Poulsbo, WA 98370 (360) 779-2266. We have been going here for special occasions for years now and it is still as good. I had the catch of the day (grilled fish over angel hair pasta with a basil cream sauce), my daughter had Fettuccine Alfredo and her friend had the lasagna and all three dishes were top notch. 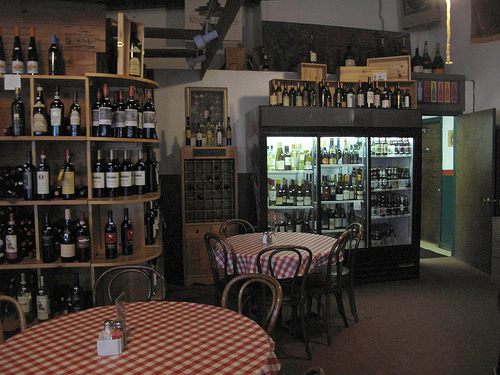 They also have an extensive selection of wine and even a small wine shop, though we stuck with soft drinks. During pleasant weather (which is the opposite of what we had today) there is outside seating. This entry was posted in Poulsbo, Restaurants, Sit Down Establishments, WA State - Kitsap County and tagged Fettuccine Alfredo, lasagna, Poulsbo, restaurant, That's-A-Some Italian Ristorante on February 12, 2011 by admin.